the light hit of a fifty-pounder? A small rockcod? Now, as I bring up the rod to assess the damages, the back reel cries at its loss of twenty-five yards of line ripped from the spool. Instantly, my fourteen-year-old guest, Alex, grabs the rod and sets the hook into what seems to be a whale. 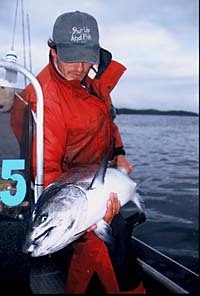 Hes renewed with energy at the thought of beating his fathers thirty-five pound tyee resting in the fish box. Alex hangs on with all the power he can muster as the chinook continues its powerful surge toward Alaska. Thirty strenuous minutes later, the fish takes position on the bottom and now the real tug-of-war is set to begin. Seeing the strain on the boys face, I suggest to his father to assist in the battle. With both anglers working the rod, the salmon makes its slow ascent to the surface for our first viewing. The proud father shouts That fish makes mine look like bait! Slowly the great fish tires and turns on its side, making the final nerve-racking journey toward the net. With the fish in the boat, it feels like a cloud of stress has lifted. After a small celebration, we weigh the chinook in at fifty-two pounds, making Alex one of the youngest owners of the highly sought fifty pound club pin. This was his first salmon ever. The place is Naden Harbour, located at the northern tip of the Queen Charlotte Islands, about thirty miles east of world famous Langara Island. These waters may possibly be home to more fifty-pound chinook than anywhere else in the Pacific. Not only can you experience some of the best salmon fishing that your arms can handle, but the area also supports an abundance of halibut, lingcod, rockcod, and numerous other sportfish. The large chinook salmon, (which can grow in excess of one hundred pounds) arrive in droves starting in early May, fresh from their migration through Alaskan waters, making their way by the northern Queen Charlottes Islands. They aggressively search the shallow, sandy bays and points of Naden Harbour for needlefish, anchovies and the abundant herring, becoming easy targets for the anglers sampling the bountiful waters of this majestic Pacific haven. For decades, the Queen Charlottes were the secret locale of commercial fishing fleets willing to make the long and sometimes dangerous journey across the Hecate Strait. These boats could fill a weeks fishing quota in a single day. In the early 70s, recreational fishing was growing rapidly in coastal B.C. and new locations to pursue the salmon were being sought out. Rumors of the Charlottes soon spread and almost over night resorts and lodges dotted the northern coast, making it possible for the everyday angler to undergo the Haida Gwaii (the Queen Charlotte Islands) experience. Over the years, numerous techniques have been implemented to target the sometimes-wary chinook. You could spend hundreds of dollars on flashers, hootchies, plugs, teasers, the list goes on and on. Still, one method has proven itself over the years to be the best--the cut plug herring. Every fishing guide I have talked to seems to have his own perfect system that he presents to the fish. As a guide myself, I depend heavily on the cut plug roll. The cut plug herring consists of a large herring (six to eight inches in length) cut on two angles. The angles are essential to achieve the roll desired. Placing the herring on a flat surface, take a small knife and hold it behind the gill plate. Make two forty-five degree angle cuts on the bait, one vertical and one horizontal. Next, insert the knife into the stomach cavity, twist the knife and remove the entrails. For more consistent cuts of your bait, your local Wal-Mart or sporting goods stores should sell a herring cut box, which is a small miter box for cutting herring on these angles. On the line you have your basic two-hook set up with the top hook being known as the lead hook and the bottom called the trailer. First take the lead hook and place it next to the back bone on the high side of the herring. Second, take the trailer and place it along the lateral line near the tail of the herring by burying the hook in the skin. That is the basic cut, but just like everything else in the world there are endless options to try. Experiment to see what you like the best. One of the most experienced guides on the coast once told me,  It doesnt matter what it looks like as long as its spinning! I almost agree with him. The main thing with a particular roll is that you feel confident in it, and confidence is ninety percent of fishing. I personally like a tail whipper, achieved by a smaller vertical cut and a standard horizontal cut. Rods and rigging for this system are as easy as they get. The rod and reel combo usually consists of a 106 mooching rod and a knuckle buster single action reel loaded with 300 yards of 20-30 pound test. On the main line there is a 2 to 10 oz. banana style or slide ball weight, (8 to 10 oz. being the most popular). A good bead chain swivel is essential to avoid line twists and an eight-foot leader of 15 to 25 pound test with tandem hooks (usually a 5/0 for the lead and a 4/0 for the trailer). The chinook salmon in Naden Harbour are found tight to the coastline and inhabit the upper column of the ocean. I have found the majority of my success fishing tight to the points and bays of the area, staying in close proximity to the kelp where the mighty chinook often lurk, waiting to intercept bait washed through by the current. Depths that chinook choose to travel vary from day to day. On most occasions they can be found cruising the thirty to fifty foot-mark. Try staggering your line depths to cover this distance and keep in touch with other anglers to see whats working for them. Once the chinook have been located, you can focus more of your effort at that level. The trolling speed for chinook in the Naden Harbour area is quite slow. I have found the best results kicking my motor in and out of gear periodically to keep at a reasonable speed. Try and use the angle of your line in the water as a gauge. Ive noticed that keeping the lines between a 45 and a 90-degree angle works the best under most situations. Peak fishing times for large chinook salmon (thirty pound and larger) tends to be later in the summer months, specifically early to mid August but great salmon fishing can be found from mid May through mid September. On my first visit to these islands, I experienced one of those days we all dream about. It was a calm, crisp, June morning with a light fog silhouetting the point we were about to fish. We pulled into the fishing hole anticipating that first hook up like a child on Christmas waiting to tear into the gifts under the tree. There were about twenty boats in the area, which were all hooked into fish. Fumbling to get our rods in the water, I gazed at my sounder and marked numerous chinook from the surface down to one hundred feet. I lowered the lines to staggered depths to locate where the most action would be. The rods managed to stay still for all of two minutes before we had the first of more than thirty fish we would tie into in less than five hours. Ten to two hundred feet, fast or slow troll, it didnt matter what we did, we caught fish! 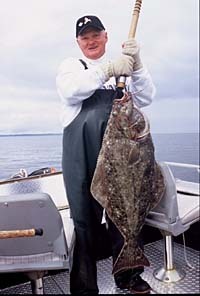 With sore arms and aching bodies we decided to rest awhile and go offshore for some halibut. On the first drop of the gear, a feisty twenty-eight pound chinook engulfed the bait. There was no escaping them. I have always dreamed about what it used to be like fishing on the British Columbia coast hundreds of years ago before a line had ever been cast in the ocean. Endless large chinook, slashing at your bait and having more fish on in a day than you could ever ask for. In this day and age of bright lights and big cities this probably sounds far fetched, but for me I have lived out my dream year after year in this bountiful part of the ocean. If you would like to experience more rod pounding, bone jarring, hook-ups than you can imagine, in one of the worlds most breathtaking rainforest settings, then Naden Harbour of the Queen Charlottes Islands is calling you. available upon request) hiking, nineteenth century native village tours, whale watching and much more. For more information on packages and avalibilities call 1-800-688-8959 for US and 1-800-655-9980 for Canada.